Graphics Card may not be the essential component for an average or normal user but it is the most important component for high end gamers and people who run resource intensive graphics applications or softwares. Graphics Cards are very advanced devices and are made up of complex components. So here I will explain you about the details and use of different components of a Graphics Card as many users are not aware of it. 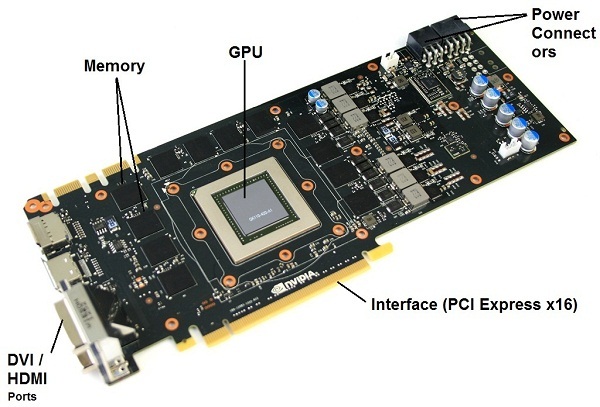 Here are the most important components of a Graphics Card. Graphics Processing Unit or commonly known as GPU is the heart of the Graphics Card. It is the main component of the graphics card where all the graphics processing takes place. 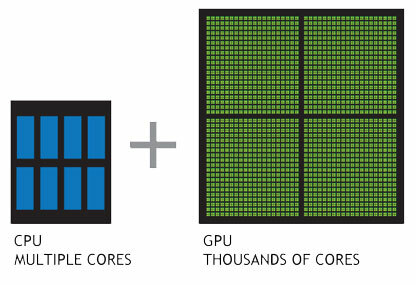 Unlike CPU that has only 2 – 16 cores, a GPU processor is made up of hundreds or thousands of small cores or units that runs in parallel to perform complex graphics operations. Nvidia called these cores or processors as Cuda Cores or Shaders and AMD / ATI called them as Stream Processors. GPU Clock – The speed at which GPU runs is called the GPU Clock or Frequency. Shaders Clock / Frequency – The speed at which these cuda cores / shaders runs are called shaders frequency and it is in synchronization with the GPU clock. Memory is the place where all the complex textures and other graphics information are stored. GPU fetches the textures from the memory, processes them, send it back to RAM and then it sends it to the RAMDAC and then to your LCD Screen or monitor. RAMDAC is Random Access Memory Digital to Analog Converter which converts the image to the analog signal and sends them to your Monitor or LCD screen through display cable. Graphics Cards have different types of memory depending upon the GPU used in the graphics card. The most common type of memories used in graphics cards are GDDR3 and GDDR5 RAM, where G stands for Graphics and DDR stands for Double Data Rate. Graphics Card RAM or Memory is much faster than the Memory used in your Desktop or Laptop. 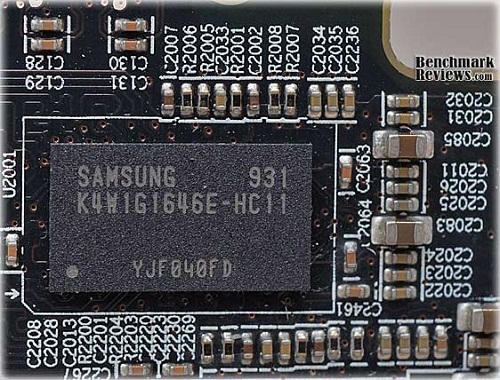 The internal interface is the one through which your Graphics Card connects to your motherboard. 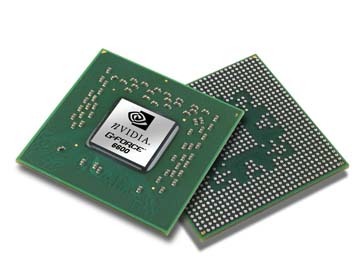 Older graphics cards uses AGP (Accelerated Graphics Port) interface to connect to the motherboard but now it has been replaced by much faster and efficient PCI Express 2.0 x16 interface. The motherboard should also have the PCI Express x16 slot otherwise you will not be able to use the card. 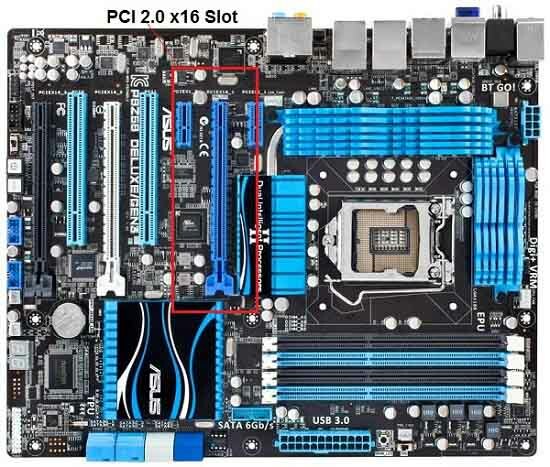 Some motherboards have two PCI Express x16 slots side by side, so that you can use graphics cards connected in SLI or Crossfire mode for increased performance. Heatsink and Fan forms the cooling part of the graphics card, which are used to lower down the temperature of GPU and RAM (in some cards). Heatsink is a passive cooling device that is made up of copper or aluminum and its main purpose is to take the heat away from the GPU and dissipates it in the surroundings. Fan is an active cooling device that blows air onto the heatsink to make heatsink cool down faster so that it can draw away the heat quickly from the components. 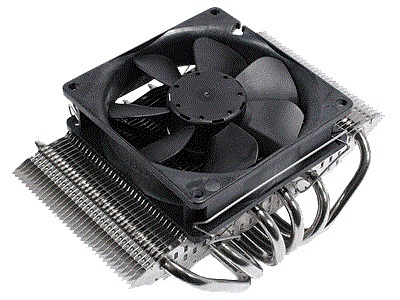 Some low end graphics cards are equipped with only heatsink but the all the mid and high range ones have both heatsink and fan combination for proper and efficient cooling. 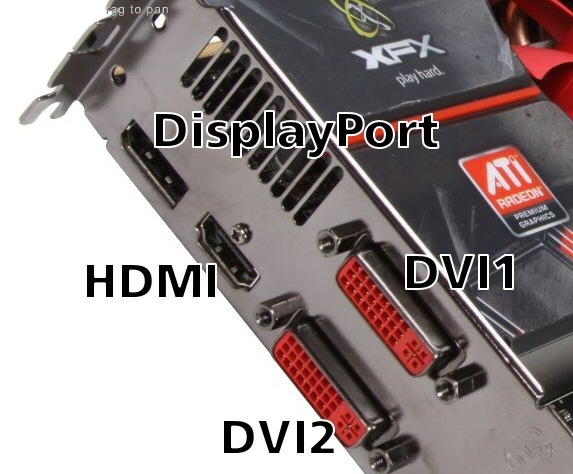 The power connectors are only present in mid to high range graphics cards because these cards need additional power for their operation. These are 6-pin power connectors and in high range cards there can be two of these connectors present. 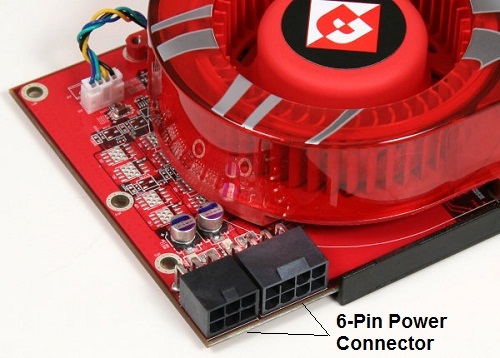 Low or budget range graphics card do not have these 6-pin power connectors as they do not require that much power for their working and they draw power from the motherboard PCI Express x16 slot only. 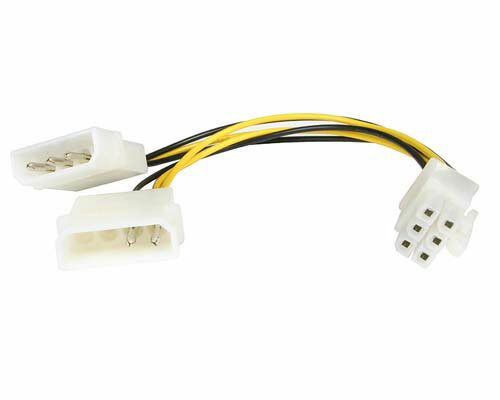 If your SMPS or Power Supply does not have the 6-pin power connector then you will need the 6-pin power connector cable as shown in the picture below. They forms the external interface of the graphics card. They are used to connect your Monitor or LCD Screen to your Graphics Card by means of relevant cable. Low end graphics card have only VGA and DVI (Digital Video Interface) ports while the high-end ones have both DVI and HDMI (High-Definition Multimedia Interface). Both DVI and HDMI are digital interface but in HDMI the audio signal or sound can be carried by it. All these components are embedded on the PCB (Printed Circuit Board), which you can say forms the motherboard of a Graphics Card. Besides all these major components, other smaller components like capacitors, diodes, resistors etc. are also present on a graphics card. A Professional Blogger, Web Developer, Hardware Enthusiast, Gamer, Geek and Founder of many other websites. He holds M.Tech degree in IT and B.E degree in Computer Science & Engineering. Can i fit my ddr5 graphic card in my ddr3 mother board and ddr 3 ram??? Yes you can. There is absolutely no relation between graphics card memory and your motherboard RAM or memory type. Can a zotac nvidia geforce Gt 730 2gb ddr5 graphics card support Intel DG41TY (DDR2) motherboard? What does 6 phase power or 8 phase power means does it relates to pci e connectors on the gpu? I think you mean 6-pin and 8-pin PCI-Express connectors. They are used to power midrange and high end graphics cards. Can this ZOTAC GeForce GT 210 1GB DDR3 Graphic Card will work in Intel H51 based (pci express v1.1 x16 slot)mother boards? I am using Gsonic H51 based mother board. I just want this graphic card for its HDMI port only. Not interested in playing games. Will it work? Yes it will work fine with your motherboard. What bracket are you referring to? Where do I put the thermal pads on a GALAX GTX 1050? Do I put it in the VRAMs only? Can you share the exact model number. It is usually on VRAM and VRMs. Well, you can put on both VRM and VRAM if there is enough headroom. How to Ask your Query? Akshat Verma is the Founder of this Technology Blog. A total Computer Geek who spends more than half of his time on computers and also has a passion for computer games.You can find him on GooglePlus.